Kirtan is practised in groups where a lead singer sings a relatively simple mantra and then everyone else joins in the response. If an individual can't sing so well it doesn't matter - all voices together are carried by the group. And the group always sounds nice together. 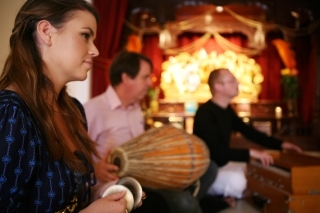 Kirtan is deeply satisfying when one applies one's mind to hearing the mantra. If you can imagine a football stadium where 50,000 fans are chanting a powerful melody in unison - the effect can feel like it can move a mountain. The chant, the emotion, the challenge and the human spirit are all intertwined in something big and beautiful. Similarly Kirtan raises the spirit. I visited ISKCON temples in India, Belgium, England and Hungary and took part in kirtans with many hundreds of people - the effect is so powerful that one feels strong, proud (in a good sense), confident, enthused, enlightened and happy all at once. A wonderful story of the spiritual history of mantra chants, as told to a young boy in the late 1970's. Sri Prahlada Das (who was that young boy) is now the leading kirtan-yoga artist in Australia. 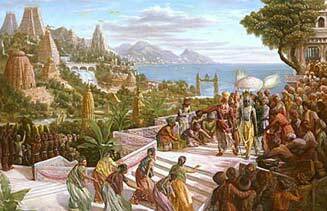 "...I had bought the (kirtan) album Prabhupada did in New York, and John and I listened to it. I remember we sang it for days, John and I, with ukulele banjos, sailing through the Greek islands... like six hours we sang because we couldn't stop once we got going. As soon as we stopped it was like the lights went out. It went to a point where our jaws were aching, singing the mantra over and over...We felt exalted; it was a very happy time for us"